It's 100 degrees in Portland. I do not want to turn on the oven! Our little house cooks in this kind of weather and adding another 300 degrees just isn't gonna happen. So, it's BBQ time! 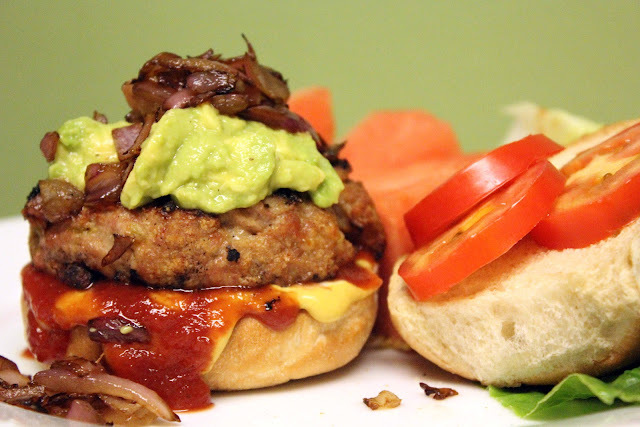 We made green chili turkey burgers, these were not spicy, but really flavorful, tender and juicy. We ate them covered in grilled onions and guacamole with watermelon slices on the side. Awesome 100 degree solution. With your hands, mix together the ground meat, chilies, cheese, bread crumbs, egg and salt. Form into four patties* and let the meat rest for 10 minutes or so while the grill heats up and you sort out your fixings. *I once read on the Internets that if you make an indentation in the middle of your burger patty they will cook up flat rather than like over-inflated footballs. It works! It works! If it's not 100 degrees, or if you're blessed with AC and feel like turning on the oven, I think this would make a great turkey meatloaf rather than grilled burgers. The egg and breadcrumbs keep everything together nicely and the chilies and cheese keep everything juicy.